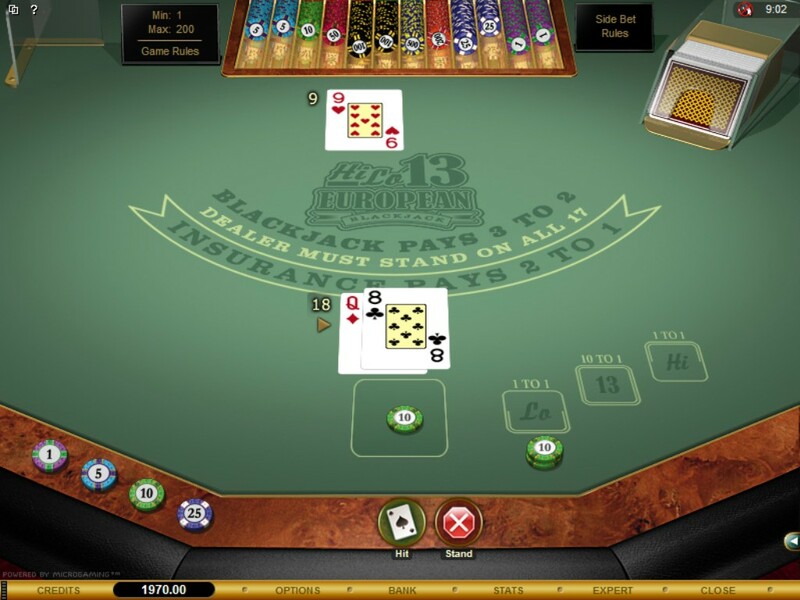 The High Low 13 Blackjack game is one of many variants of blackjack that are both based on the European Blackjack game and also let players place a range of different side bet options in the hope that by predicting the value that the initial two cards will fall into a range of bonus payouts can be won. The game can be played for different stake options and the three side bet options which we shall cover shortly are completely optional so you are never under any type of obligation to have to place them alongside your base game hand, but they are always available if you do wish to win a range of additional bonus winning payouts, no matter whether you base game hand wins or loses. The game is played to the standard European Blackjack game play rules which means the dealer doesn’t deal himself a hole card just one initial facing upwards cards until the player has made his or her playing and betting decisions. The dealer also plays his hand until it is worth 17 or higher and will therefore hit any hand he has deal himself if it is 16 or lower in value. There are two decks in the shoe of the Hi Low 13 Blackjack game and those cards are always fully shuffled before a new game is sent into live play. The side bet comes with its own minimum stake amount which for reference is as low as just 1.00, however when you play the base game you can place a wager form as low as 1.00 or as high as 200.00 per hand. The bonus bet option is determined by the outcome of the first two cards dealt out to your hand, you have three different side bet options the first will see you placing a bet in the hope your first two cards dealt out will be worth lower than 13 in value which if correct pays out as even money, as does the third betting option which is that the first two cards dealt out to your hand will be over 13 in value. The second side bet option is a bet on which you are hoping your first two cards dealt out are going to be worth exactly 13 in value and if so you are paid out at odds of 10 to 1. The other winning payouts awarded on the base game hand include a 3 to 2 winning payout if you are dealt out an unmatched blackjack hand, a payout of even money will be awarded on all other hands won by the player. The insurance side bet wager which you should never take due to its high house edge pays out at odds of 2 to 1 and when you play the base game alone and never place the side bet options with perfect blackjack playing strategy you can get the house edge down to just 0.42%. If your base game hand is valued as a hard 9, 10 or 11 hand then you will have the option of doubling down your hand, if you do double down another wager needs putting onto the blackjack betting layout for you to be dealt out just one additional card to your hand which must be equal in value to the base game bet. Splitting is permitted when you are playing this game but you cannot split unalike 10 valued cards but all other pairs can be split. If any ace has been split then multiple cards can be dealt out to that ace. Below are a few easy to remember playing tips we would like to pass onto you, by following the tips below and also referring to the blackjack strategy card for this game which is displayed on this web page you will always be playing this game optimally. Surrender – No surrender options is available on this game two games which will let you get half of your stake returned to you when you give up you hand halfway through a game are the Atlantic City Blackjack game variant and the Big Five Blackjack game. Doubling Down – The double down option should always be taken when you have a pair of fives or a hard 10 or 11 valued hand when the dealer is showing a 2 to 9 valued card and also double down a hard 9 valued hand when the dealer has on show a 2 to 6 valued card. Hitting a Hand – You should always hit your hand without thinking when it is worth 5 to 8 or is a soft 13 to soft 17 valued hands. When to Stand – You should stand any hand when it is worth a 19 or a soft 20 valued hand matter what card the dealer is showing. Insurance – Even though when you take the insurance wager and the dealers hand is a blackjack hand and is paid out at odds of 2 to 1, this bet is a very poor valued one and as such you should never take it for if you do you will quite significantly increase the house edge. 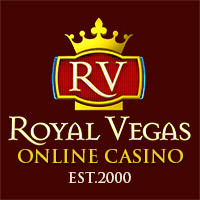 Players are always rewarded with real money playing comps when playing the Perfect Pairs Blackjack game variant online, but be aware the value of the comps awarded to you and their redemption rates can and will vary from casino to casino, which means when you are looking for an online casino site at which to play at you should be looking for one offering an overly generous comp club or player rewards scheme. One thing to note is in regards to casino bonuses, due to the very low house edge you will be playing against if you play Perfect Pairs Blackjack optimally then you will either find an increased play through requirement is attached to any bonus sued playing his game or you may find you are not permitted to play this game with any online casinos bonus offers.